February 14th may be the most romantic day of the year, but the 13th – Galentine’s Day – is all about celebrating friendship with your best gal pals. This growing holiday trend lets both taken and single ladies get in on the fun of Valentine’s Day – hearts, chocolates, and lots of pink and red colors! Girls are opting to throw Galentine’s Day parties to spend QT (quality time) with their BFFs, doing their favorite things. That includes treating yourselves to decadent cupcakes, mani/pedis, and the sappiest rom-com movies. 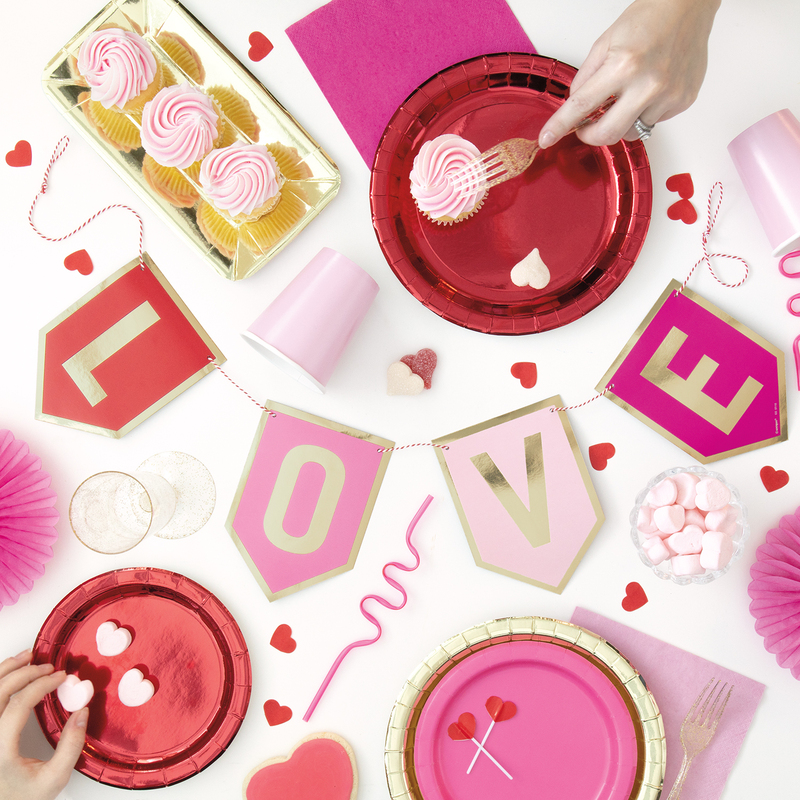 We used a mix of our adorable Valentine’s Day party supplies and red and pink party supplies to put together the perfect setting for a Galentine’s party. Here’s how we recommend hosting the ultimate Galentine girl’s night. Start by creating a snazzy party atmosphere. We used our shiny foil tableware to give the party table a little extra oomph. Having lots of color is key, so mix and match our solid tissue paper decorations to dress up a blank wall, a window, or doorway. We hung up white, red, and hot pink paper fans in varying sizes to create an eye-catching backdrop. And our cute and colorful LOVE banner serves as the finishing touch to remind your squad how much you care. Cut your desired length of bakers’ twine and set it aside. 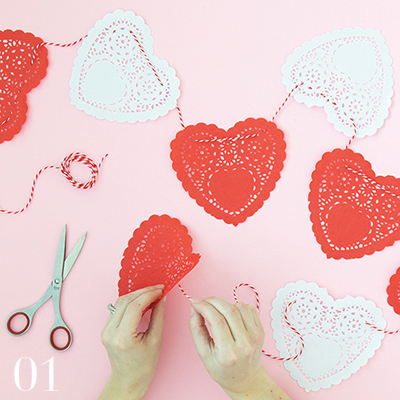 Lay out the Heart Doilies, alternating between red and white, or choose your own order! When your pattern is set, simply weave the twine through two holes near the top of the hearts. This way the doilies will lay flat with plenty of support. From there, all you have to do is pick the perfect spot to hang your whimsical creation. We’re big fans of hanging banners on the front of a dessert table, but you can also incorporate this banner into the backdrop of a photo booth, or across a doorway. No matter where you choose to display this heart banner, your closest gal pals are sure to swoon. 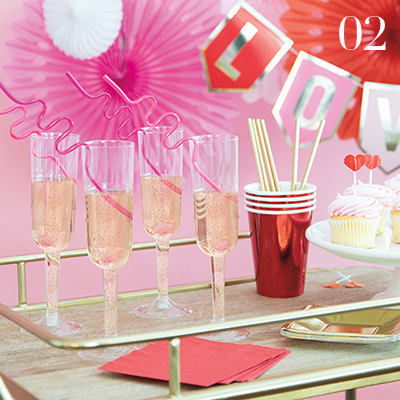 We love dressing up our bar cart for every occasion and Galentine’s Day is no different. First, focus on the drinkware (it is a bar cart, after all!). We decided to add some whimsical touches to our otherwise sophisticated accessories. Our Plastic Champagne Flutes and Squiggle Straws turned out to be a match made in heaven for our signature cocktail. And for those looking to sip on something else (Snakejuice, anyone? ), we made sure to keep plenty of empty Red Foil Paper Cups and Foil Gold Paper Straws stocked. But who said cocktails had to be the stars of the bar cart? With a petite cake stand, cupcakes, and our Heart Cupcake Toppers from our Rainbow Cupcake Kit, you can create an adorable dessert display. 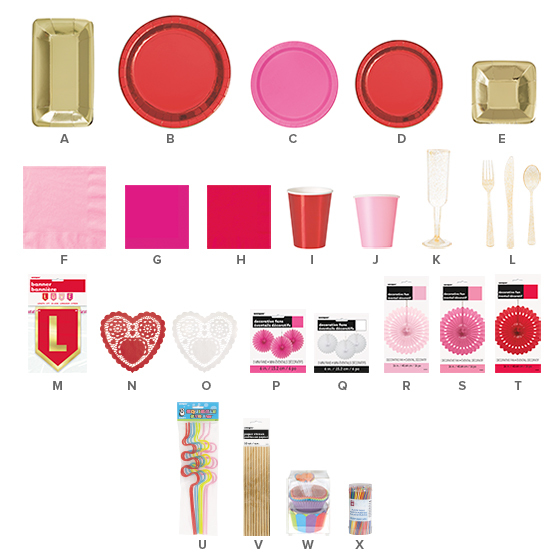 Celebrate all the glorious female warriors in your life by shopping all of our Galentine’s Day party supplies and decorations online or at your nearest party store.